"What we know and what we don't know". The talk had been viewed over 4,000 times by end 2017. The ASCENT Study into launch market demand was carried out for NASA’s Marshall Space Flight Center, and provided forecasts of 46 different market segments, including the space tourism segment. It explored price elasticity of demand and determined that only the space tourism sector can produce enough demand in the foreseeable future to make reusable launch vehicles (RLV’s) an economic proposition. 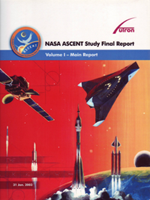 The Executive Summary of the ASCENT Study is available for free download. 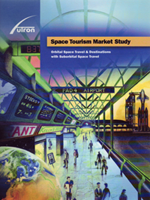 The Futron/Zogby Study of Space Tourism Demand provided a telephone survey of a statistically valid sample of millionaires, and determined their preferences for space tourism experiences at both realistic prices and realistic descriptions of sub-orbital and orbital opportunities. The Full Report of the Study is available for free download. 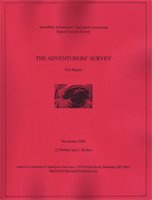 The Adventurers’ Survey of Space Tourism Preferences was conducted online in conjunction with the company Incredible Adventures. About 1,000 potential clients, who were involved in adventure holidays, were questioned about their preferences for a number of detailed items, including choice of architectures for providing the space tourism experience. The Executive Summary of the Adventurers’ Survey is available for free download from the home page of this web site, and moreover the Full Report of The Adventurers’ Survey is now available for free download. Webber provided advice for further space tourism demand forecasting efforts, including agent modeling by Spaceworks Engineering (SEI), Discrete Choice Modeling by the team at Latrobe University in Australia, and in the Tauri/Spaceport Florida/FAA forecasts of 2012 for free download here. Spaceport Associates has made contributions to the development of commercial space transportation policy in a number of areas, usually by serving as a volunteer on various technical committees. This demand forecasting information is available in book form in a number of places, including Webber-contributed chapters in Tourism and Developments — Issues and Challenges, edited by Mihalic and Gartner, published by NOVA in 2013, and in the upcoming (2019) book Space Tourism: The Elusive Dream, edited by Cohen and Spector, Emerald Books.